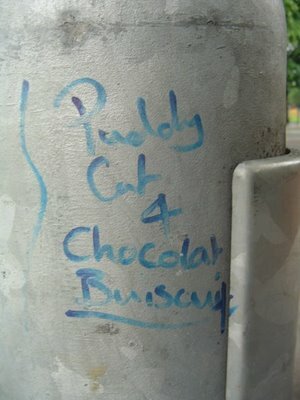 Graffiti certainly divides opinion in Manchester. Sometimes it's art, sometimes it's an ASBO. If you want to check out some of the finest examples without leaving the comfort of your home, there are 2,129 images tagged "manchester graffiti" on Flickr. There's also the street-art specialist blog MCR Marks. And now someone's documenting graffiti's lower echelons: Bad Graffiti features bizarre, silly and mispelled graffiti from the North West and beyond, stuff like "Puddy Cat 4 chocolate biscuits" above. (Wha??) The blog is the work of Mancunian Mof Gimmers (not his real name) who also writes another blog called Gimmervision. Seems most of the graffiti in this town is of the outdoor kind. Sadly, bathroom graffiti is something you never see much over here. In New York, at spots like The Hungarian Pastry Shop and the famously decrepit bar Siberia you could find amazing works in this genre, but I've struggled to find any toilets in Manchester that can come close, apart from a few scrawlings in the loos at Temple Bar (which, fittingly, used to be a public restroom.) Not that I'm encouraging vandalism or anything. Ahem. You should send some stuff in! It's bloody everywhere! Details can be found on the site. Nice to see the blog raising a few giggles.